NEW! Mt. 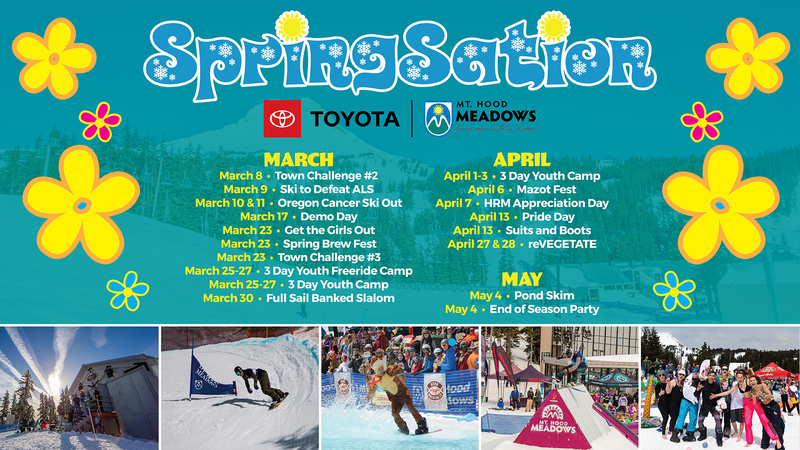 Hood Meadows announces Spring Pass pricing and SpringSation Events! You can also view on the Special Offers page. Mark your calendar! The next NWSCC Council meeting will be held Wednesday, April 24, 2019, starting at 6:30 pm with a social; meeting to start at 7:00 pm. Round Table Pizza, 10070 SW Barbur Blvd, Portland, OR 97219. Agenda: Avalanche Science Video, and speaker from Mountain Rescue about crevasses, tree wells, and how to effect rescue from those situations. Far West Ski Association Convention. Club updates for summer. The NWSCC and PACRAT Elections meeting will be held Wednesday, June 19, at the Buffalo Gap, 6835 SW Macadam Ave, Portland, OR 97219. Pizza will be provided; beverages no host. See Article below for details on elections. We would love to have candidates for the board from any of our member ski clubs, and encourage YOU to consider volunteering to be on the ballot. Timely and interesting posts are found at the Northwest Snowsports Advocates Facebook page. Also see Breaking News for quick descriptions and links. “Fun in the OC Sun” - 2019 FWSA Convention - see article below and watch video HERE. NOTE: Registrations are due by May 6th to take advantage of the $165 rate. After this date the registration fee will be $180. Bergfreunde has a special fall trip: a Canadian Cultural Tour of Ontario, including Toronto, Niagara Falls, Kingston, and Ottawa, October 3– 15, 2019, which they have opened to members of other clubs. See flier and Trips. Sign up NOW to hold your spot! How about a CRUISE? NWSCC has blocked space on a River Cruise from Eastern Europe to the Black Sea with Grand Circle Cruise Line from August 29-September 12, 2019. Tour Hungary, Croatia, Serbia, Bulgaria, and Romania! Complete details of this exciting trip HERE. Single supplements FREE; optional extensions to Transylvania, Prague, or Vienna. The 2019 FWSA Mini Ski Week to Winter Park, Colorado, is scheduled for March 24-29, 2019. See flier HERE. FWSA is sponsoring a 2019 Island Windjammer cruise around the British Virgin Islands in the West Indies May 19–26, 2019! Starting in Tortola, we will be visiting Virgin Gorda, Norman Island, Cooper Island and Jost Van Dyke. The trip is now open and they are taking registrations. Trip is limited to the first 24 people who sign up with a $500 deposit. Our own Sheri Parshall is the trip leader. FWSA has announced its trip destinations for 2020! The FWSA Ski Week will be at Big Sky, Montana, with Sports America Tours, January 25-February 1. The Mini Ski Week will be at Big White, BC, Canada, March 29-April 3. And as a special announcement, the Mini Ski Week in March 2021 will be held at Zermatt Utah Resort and Spa with Ski.com! "Fun in the OC Sun" - 87th Annual Far West Ski Association Convention! NWSCC & PACRAT OFFICER ELECTIONS - GET INVOLVED - WE NEED YOU! FWSA Awards Applications Due March 19 - Deadline extended for 3 Awards! Check the Breaking News page for the latest updates; check our Calendar to view events of interest put on by clubs and others; check Trips to see where our ski clubs are going this year. For over thirty years, PACRAT Racing has provided an easy way for skiers and snowboarders on Mt. Hood to learn the fun of recreational racing. Sound fun? Click here to learn more! The final PACRAT race of the season was held March 31. The final results for the season will be announced at the Rat Attack party to be held April 12. See details HERE. A fundraising race is scheduled for April 14 at Timberline. Prior race results can be viewed HERE.